The holidays are right around the corner, schedules are becoming increasingly hectic and there’s limited time to get everything done. Here are a few insightful tips that homeowners can utilize to make preparation for the holiday as easy as possible. Before the time comes to think about decorating homes and getting them ready for the holidays it might be a great idea to start holiday cleaning by dismantling and reorganising. De-cluttering cramped congested areas in your living space is a great way for persons to properly function and be on their way to performing other tasks without restriction. It also helps persons to meet the challenges of cleaning homes in a more efficient manner. Get rid of items you don’t use or items that no longer work and make arrangements for them to be removed from your home. Next you can move to areas like closets, home offices, attics and garages to further remove and get rid of unwanted items giving homeowners adequate space to operate and make their holiday preparations. Next attempt to clear all floors throughout the living space and rearrange furniture and decor to improve mobility as you go. Old rugs and carpets should also be removed and thrown out however any stuff in good condition but unwanted could be placed in a few boxes and sold, donated or recycled. When attempting to conduct cleanup around the yard and outdoor areas of your home renting a MINI dumpster can also serve as an adequate, convenient, solution for all your holiday cleaning. From bulky waste to yard waste MINI dumpsters can accommodate up to 12 cubic yards of waste and provide a walk in option to prevent injury or hassle. MINI dumpsters are also driveway friendly and occupy little space. So to consolidate all your cleaning and disposal needs with one straightforward provision homeowners could consider the convenience that a MINI dumpster can offer when conducting holiday cleanups. 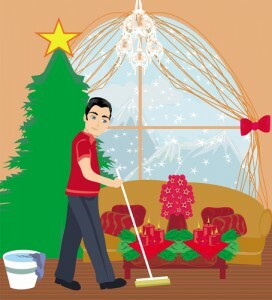 Contracting a junk removal company to help you with holiday cleanup tasks is another ideal way to manage holiday cleaning. With the necessary equipment and personnel a junk removal company can come in and help homeowners to quickly and safely remove any unwanted items they may have in or around homes. This service is a great way to facilitate the removal of large heavy items or hazardous waste that can pose threats of serious injury or harm to health. This service is highly recommended as it also eliminates the hassle of transport and disposal of waste items. Rated # 1 in the country for junk removal services let us come in and assist you with any holiday cleaning or junk removal you may have. Here at Junk King we offer affordable rates and top notch waste removal services 7 days a week to facilitate clean, spacious surroundings in and around homes . So to arrange fast, professional and affordable waste removal services you can visit our website at www.junk-king.com to book online or call us at 1-888-888-JUNK (5865) to schedule an appointment right away. This entry was posted in Uncategorized and tagged computer disposal, junk hauling sonoma, Junk King Sonoma on October 24, 2017 by Julian Torres, "JT". Last updated November 7, 2017 .